Comments: Football isn’t about plush seating at Peterborough, free prawn sandwiches at Arsenal’s club level or toilets that resemble anything nicer than a gutter running by a dirty wall, it’s about six hour round trips to the depths of Hereford on a rainy Friday night to watch non league football, that’s real football. To add to the arduous journey was an impeccably useless set of muppets working the turnstiles at Hereford at a rate so slow it would be make Per Mertasacker look pacey, their incompetence incensing the late Aldershot fans. After my Dad and co pie eater’s riot attempts failed and the seemingly pleasant woman in front had told the ticket man to F-Off it was high time for pie time. Cheap, cheerful and wholly forgettable ( not that it was particularly bad I literally can’t remember it ) the meat pie had all the hallmarks of a very average football pie. 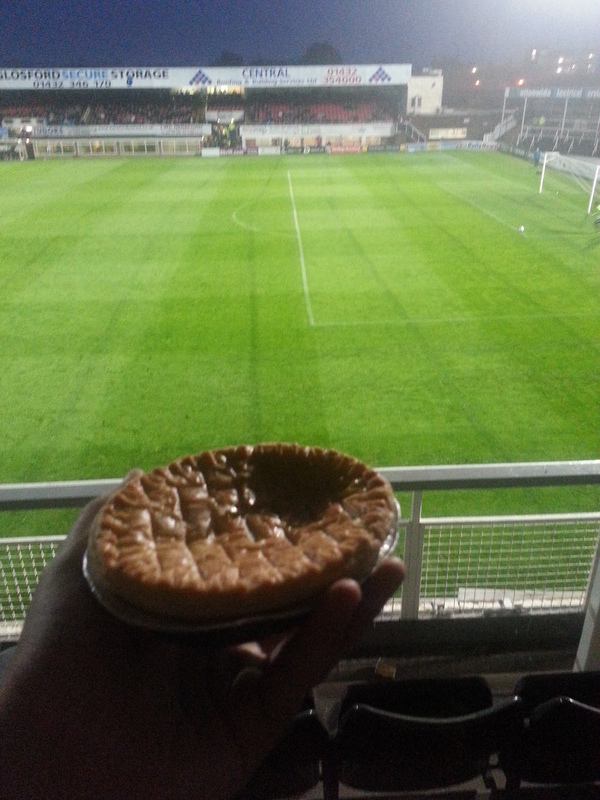 Normally the lower you get down the leagues the better the pies are but this was a generic one disappointingly. Aldershot claimed a great two nil win to lift themselves off minus points in the Conference and briefly let me forget about the rain, the long queue to get in, the average pie and the 3 hour journey home. Alas it’s hard being a football pie review.